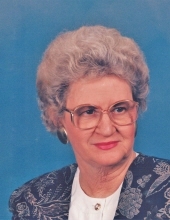 Mrs. Jean B. Biggers, 89, of Greenville, passed away Wednesday, March 27, 2019, at Twin Fountains Nursing Home in LaGrange. Born June 21, 1929 in Macon, Mrs. Biggers was the daughter of the late Landis Braswell and Ophelia Rowe Reeves. She was a lifelong resident of Greenville, a member of Greenville United Methodist Church and retired from the Meriwether County Department of Children and Family Services. A talented artist, Mrs. Biggers loved playing Bridge and was a master of cross word puzzles. Survivors include her daughter, Billie Rosen of Greenville; son and daughter in-law, Jimmy and Martha Bailey of Roanoke; 3 grandchildren, Dr. Julie and Dan Williamson, Leigh and Peter Cebulka, and Blake and Kaleigh Bailey; and 5 great-grandchildren. In addition to her parents, Mrs. Biggers was preceded in death by her husband, Willis Adolphus Biggers, Jr.; and a granddaughter, Jennifer Meyers. The funeral service will be conducted at 11:00 a.m., Saturday, March 30, in the Chapel of Claude A. McKibben and Sons Funeral Home in Hogansville. The Reverend Ron Capes and Rev. Martina Bober will officiate and interment will be in the Greenville Cemetery. The family will receive friends at the funeral home from 10 until 11 Saturday morning. To send flowers or a remembrance gift to the family of Jean B. Biggers, please visit our Tribute Store. "Email Address" would like to share the life celebration of Jean B. Biggers. Click on the "link" to go to share a favorite memory or leave a condolence message for the family.